A programmable logic controller, PLC, or programmable controller is a digital computer used for automation of typically industrial electromechanical processes, such as control of machinery on factory assembly lines, amusement rides, or light fixtures. PLCs are used in many machines, in many industries. What PLC can do for elevator? Features on the case: indicator lights are 485, BTL, ERR, SINK, SOURCE, POW, and RUN. 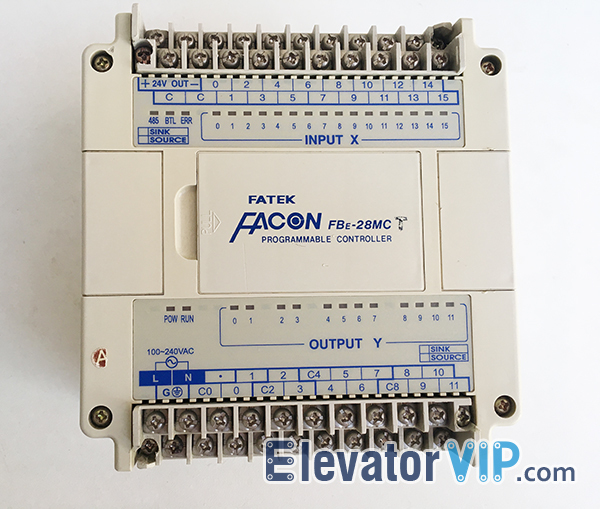 If you need Programming Software and User Manual (Fatek PLC Programming Manual) of FBE-28MCT PLC, please contact Elevator Vip. We also can offer other models are FBE-20MA / 20MAT / 20MC / 20MU / 20MUT / 28EA / 28MA / 28MU / 28MUC / 32EX / 40MA / 40MC / 40MU / FB-2DAS.